The conversation began with Iwata pointing out that Mario’s history has tended to see one 3D Mario per console. He asked Miyamoto if having a second 3D Mario on Wii made him feel how he felt when releasing Majora’s Mask as N64’s second Zelda game to follow Ocarina of Time. This was indeed the case. Majora’s Mask was meant to make use of the 3D framework of Ocarina of Time. The reason for this, explained Miyamoto, is that when you make a new game, you spend a full year working just on player movements. After having spent a lot of energy making a good play control system, they felt it would be a waste to just make some stages and end it. Naturally, this isn’t really a surprise. When making Majora’s Mask, they used the framework of Ocarina of Time, which eliminated virtually an entire year off the development time just like with Super Mario Galaxy 2. This isn’t necessarily big news for Zelda people, but it shows that Nintendo does indeed use game plans for other games in working on different franchises. One has to wonder, could the development cycle then that lead to Super Mario Galaxy be used for Zelda Wii? Time will tell I guess. On a side note, apparently in a previous Iwata Asks it was confirmed that Ocarina of Time only had 3 years of development time, making Zelda Wii the longest developed Zelda title in the history of the franchise. Iwata: Since you both felt that you’d done everything there was to do, what made you decide to make another The Legend of Zelda for Nintendo DS? Aonuma: Well, there are some definite similarities between that sequence of events and the way The Legend of Zelda: Majora’s Mask3 came from The Legend of Zelda: Ocarina of Time. Iwata: That’s right, the situation now is similar to the way things were with the N64. Aonuma: Very similar. If I start telling that story, though, we could be here for a while. Is that all right? Iwata: Of course, please, go on. I doubt it’s even possible to talk about “The Legend of Zelda theory without mentioning that story. Aonuma: All right. Our first 3D The Legend of Zelda game for the N64 turned out to be The Legend of Zelda: Ocarina of Time. I did some direction on that one, although it was only partial: I was in charge of dungeon design. Iwata: Somehow, I had the impression that you’d been overseeing everything since Ocarina of Time, Aonuma-san. Now that I think about it, I guess that wasn’t the case. Aonuma: Well, and they pretty much let me do whatever I pleased. So when we made The Legend of Zelda: Ocarina of Time, I felt very strongly that we’d given it our best. Iwata: When The Legend of Zelda: Ocarina of Time came out, people said it was far above the average level of games at the time, so I’m sure you did feel you’d done your best. Aonuma: That’s right. It made us very, very happy (laughs). Even after its release, I felt that we’d really done something special; I felt very fulfilled. At the time, I think (Shigeru) Miyamoto-san had that same feeling, but apparently he also felt as though there was still quite a lot left to do. Aonuma: And so he said: we’d already made 3D models for The Legend of Zelda: Ocarina of Time. By changing the situation, couldn’t we make new ways to play, a new story? 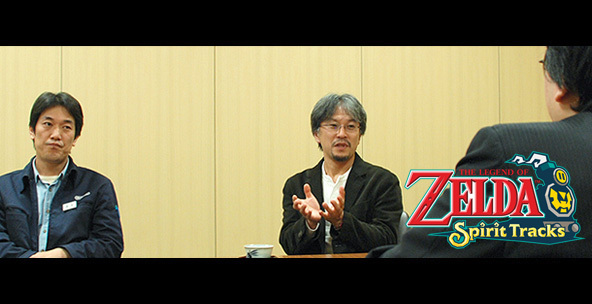 Iwata: So you made The Legend of Zelda: Majora’s Mask. Aonuma: No, we didn’t just start making The Legend of Zelda: Majora’s Mask, not right away. There was actually a flip-side, and in the beginning, the idea was to make a “Ura (Flip-Side) Zelda”. Aonuma: Ultimately, other staff members handled The Legend of Zelda: Ocarina of Time: Master Quest. Still, as someone who has been in charge of the dungeons, I just couldn’t get that excited over making a flip-side for them. I couldn’t see it turning into a new The Legend of Zelda, either. But we’d been told to make The Legend of Zelda. It isn’t as though we could just say, “I don’t want to”, and end it there. At that point, Miyamoto-san gave us a tradeoff: he said, if we could make a new The Legend of Zelda game in one year, then it wouldn’t have to be a “flip-side”. Aonuma: Yes. That was the deal. But The Legend of Zelda: Ocarina of Time did take three years to make, you know!? Iwata: That it did (laughs). Aonuma: And we were supposed to make its sequel in a year… At first, we had absolutely no idea what sort of thing we were supposed to make, and we just kept expanding our plans… At that point, the “Three-Day System”7, the idea of a compact world to be played over and over again, came down from Miyamoto-san and one other director, (Yoshiaki) Koizumi-san8. We added that to the mix, and then, finally, we saw the full substance of a The Legend of Zelda game we could make in one year. Aonuma: That’s correct. (laughs) Still, in the beginning, it was all trial and error. Ultimately, we adopted the “three-day system”, and made it so that, if you couldn’t clear the game inside of three days, the world was destroyed. Iwata: It turned out to be a very tense game, didn’t it. Aonuma: Then, in The Legend of Zelda: Majora’s Mask, you had to remember all sorts of things so that the world wouldn’t be destroyed: “Oh, there was something here, and something else over there”, things like that. That’s another thing it shares with The Legend of Zelda: Spirit Tracks.